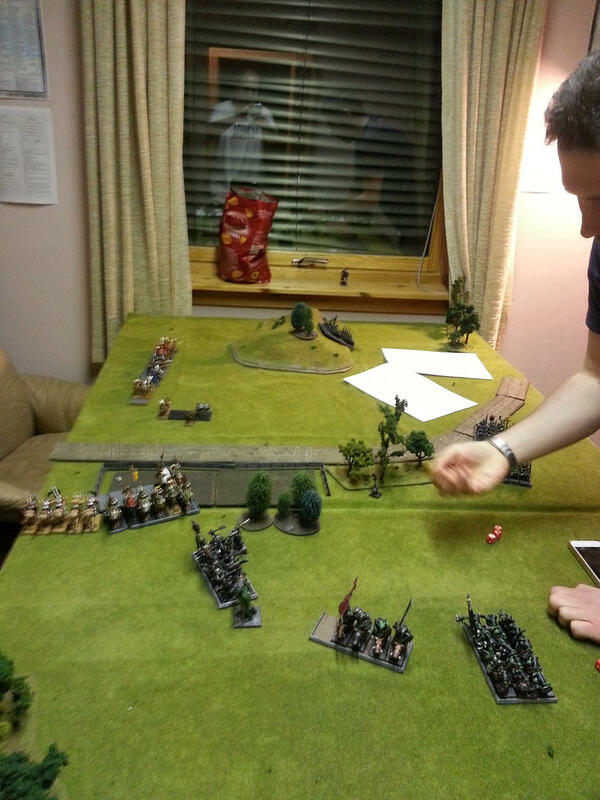 So after the hard 3 consecutive defeats in our last campaign we decided to have a new WHFB after some FOW. 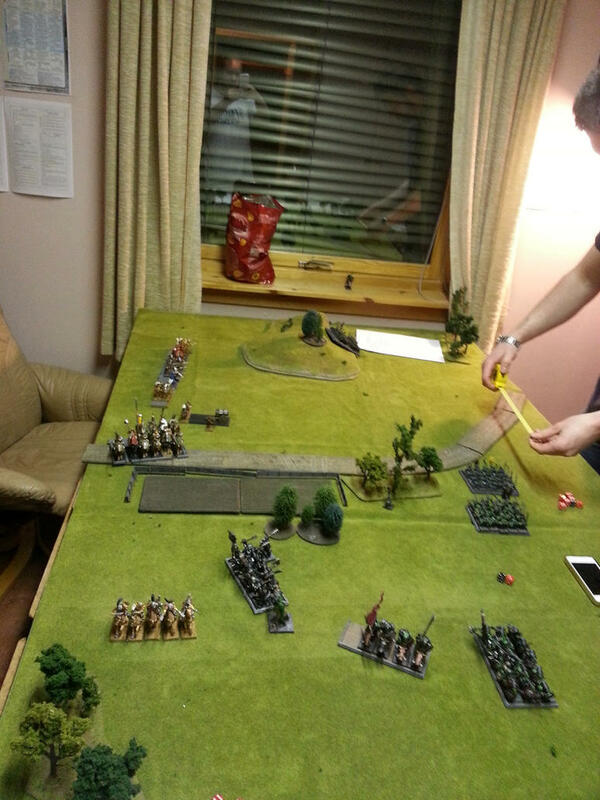 Due to time constraints we limited the battle to 1200p and standard battleline scenario. Didn't get a pic of the deployment, but he deployed his spider on the opposite side of the hill of my gunline which you can see the below. 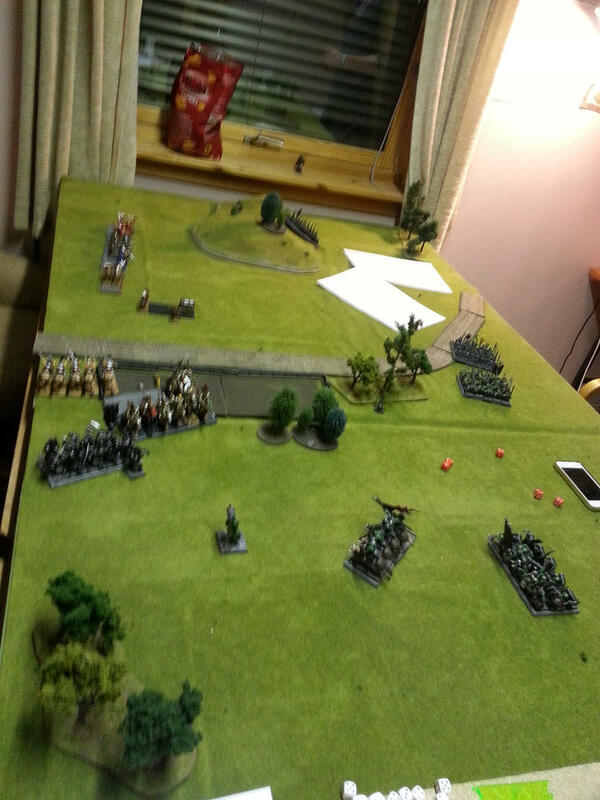 The boar boys and goblins in the middle and his orcs and troll to charge my knights. I move my knights slowly forward, everything is out of range of my gunline except for my Master engineer which snipes one boar boy. 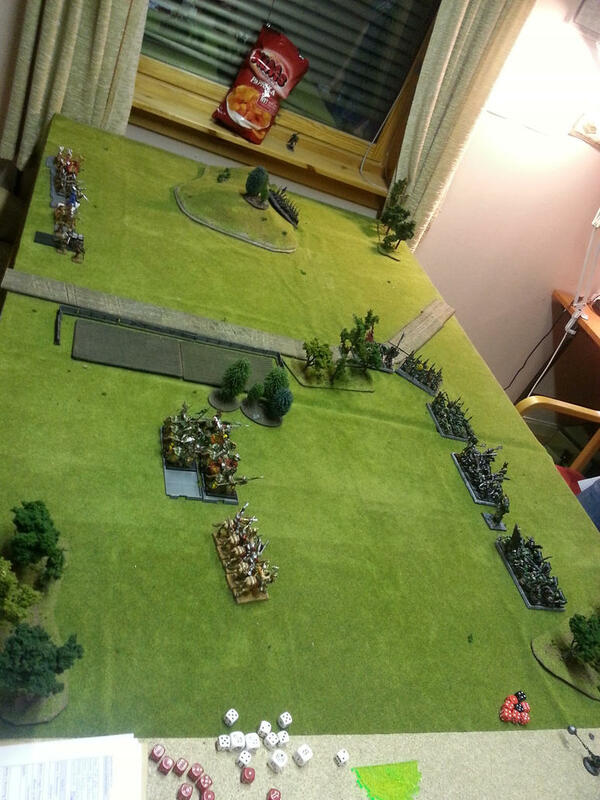 To respond to my cavalry the O&G moves all his forces to take them out. 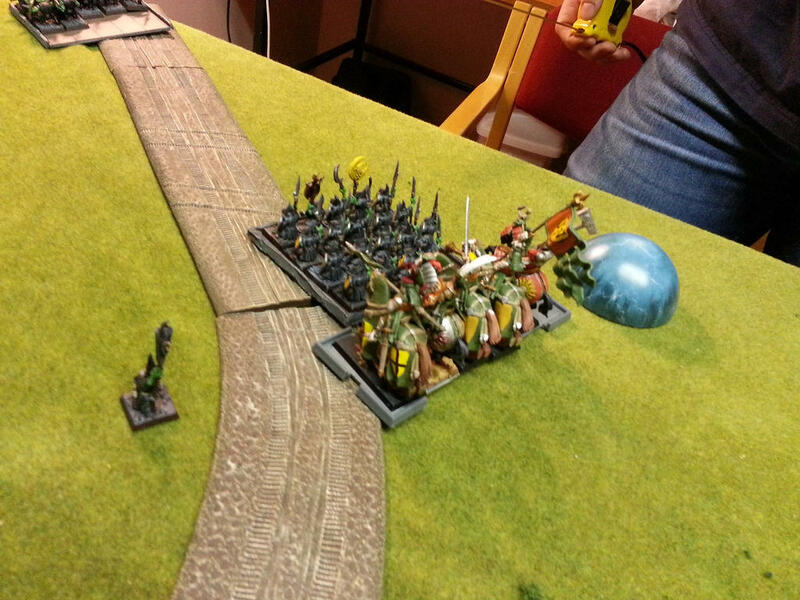 He sends his spider riders on the hill but outside my handgunners line of sight waiting for the right moment to strike. Seeing that my Cavalry is about to get surrounded and destroyed I reform and withdraw them back. Only shooting is my engineer who miss his shots. 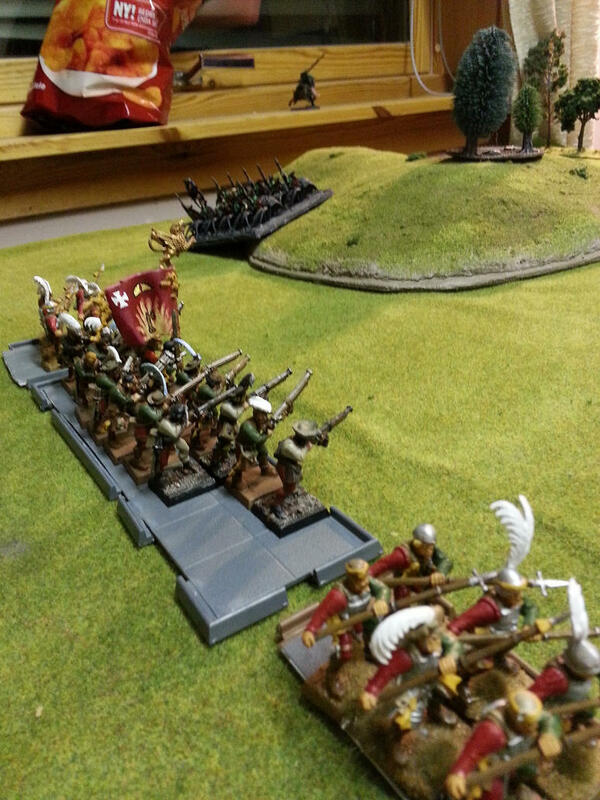 I run back with my pistoliers and charge with my knights over the fences, 2 knights stumble and manage to break their necks in addition the charge failed over the dangerous terrain. He decides to charge after my pistoliers that flee. Finally some close combat, instead of taking on the black orcs I charge my knights at the boar boys which destroy them, and I continue onwards into the Big'Uns. I have had some bad experiences with IC vs black orcs resulting in total defeat, so I wanted to safe it and go after his weaker units instead. 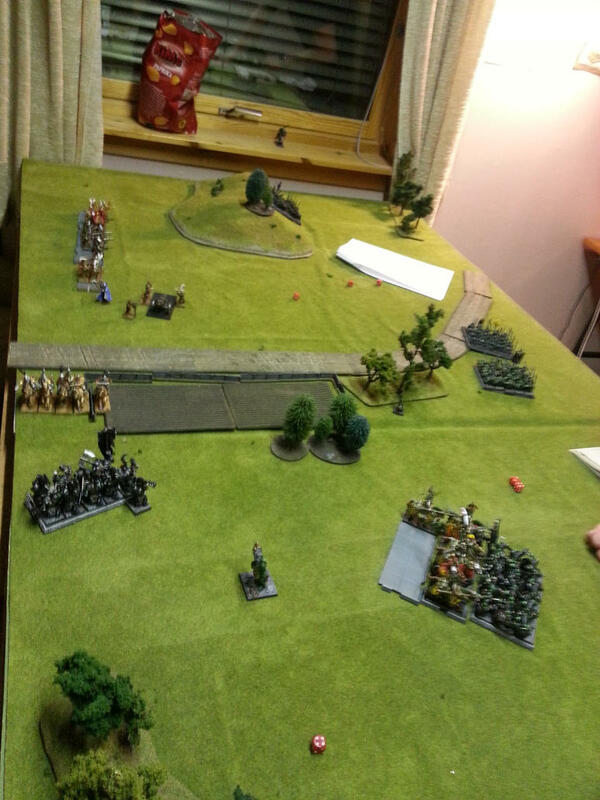 My pistoliers reform and turn to face the black orcs. But the black orcs charge the pistoliers and even though I flee the black orcs catch the pistoliers and slaughter them with within exactly one inch and now stand at the flank of my gunline! He also sends forth his spider riders now so he is attacking both flanks. Since the first 4 turns were basically nothing we went for more turns than 6. 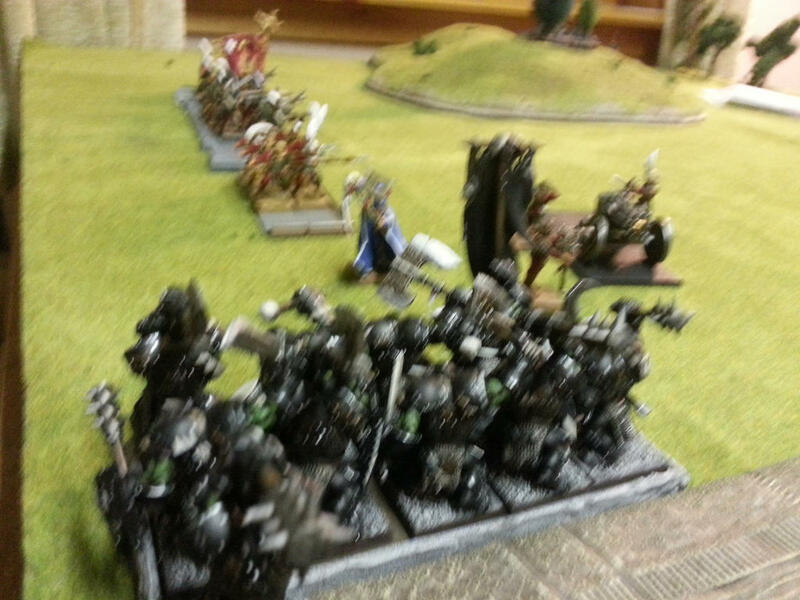 My knights scatter the Big'Uns but I do not pursue and instead reform to face the goblin shaman. I hex the big uns just for fun, and finally fire the helblaster at the black orcs, I roll double 10's so get 20 shots, 16 of them hits and 8 black orcs hit the dust Gogo helblaster! The black orcs and goblin warlord flee. Additionally the handgunners open fire at the spider riders and kill 7 of them sending them running back over the hill. The O&G stop fleeing with exception of spider riders but can't charge anything. 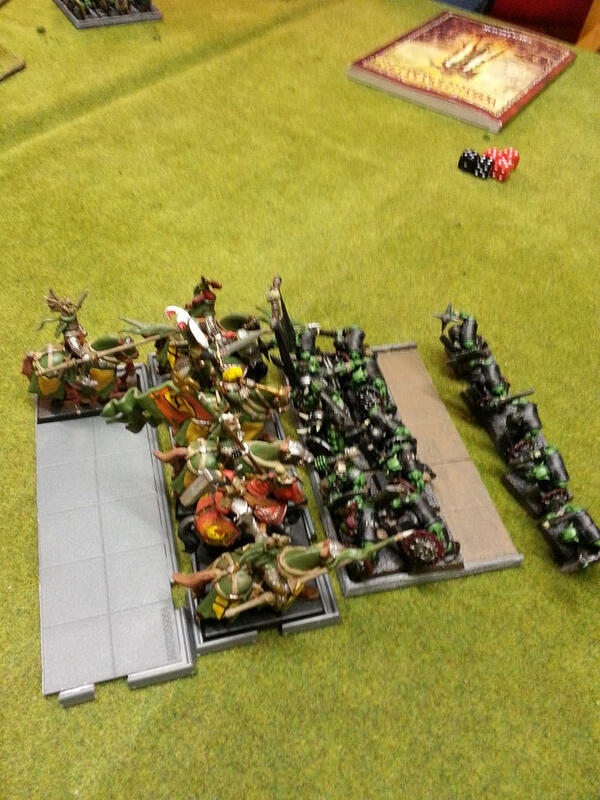 The Knights charged the Goblin shaman which flee 12 inches so instead charge the Goblins which also flee but the knights reach the vanilla goblins with 6+6+7. At this point my opponent conceded the game since it was getting late and he had nothing left that was not fleeing with only the helblaster waiting to once again blast his remaining 2 black orcs and warlord. The first turns were more about movement as both were afraid to commit to a reckless charge, which was really fun twist as both got confused as our battleplans changed completely. 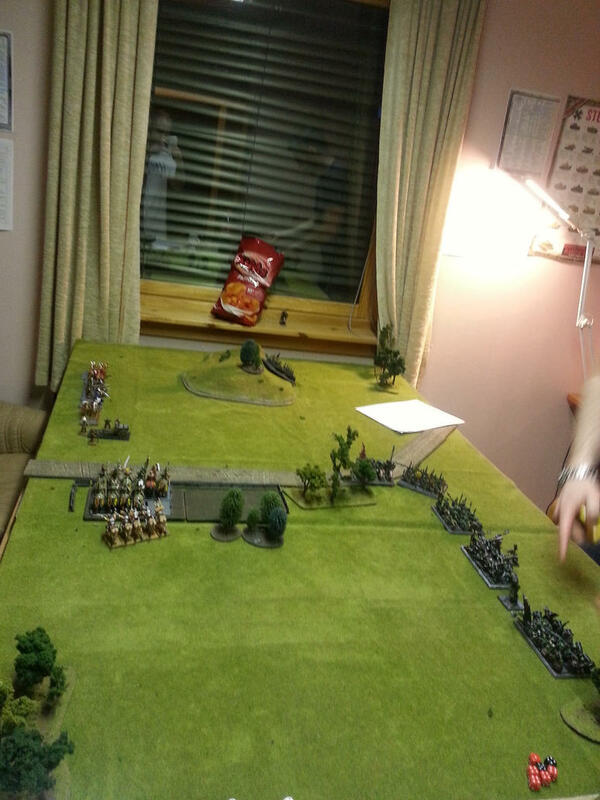 What it all came down too was the Helblaster rolling an amazing double 10's and the knights utterly destroying the boys, the war banner helped great in this regard as he had to keep rolling snakes eyes. If the Helblaster had not killed enough Black Orcs he could have easily have destroyed my warmachine and quite possibly the handgunners. So even though all of his forces were fleeing at the end it was still a close call. And I think I will run more handgunner/crossbow regiments with detachments instead of standard infantry blocks.